The period between about 1500 and 1750 brought a dramatic change in world history. During this time, Christianity became the first religion to spread around the world. Why did this happen? One reason was the energy unleashed by the Reformation and the Counter-Reformation. In particular, much Catholic missionary work grew out of the Counter-Reformation. Religious Orders were dedicated to making converts to Catholicism. The second major reason for the spread of Christianity was the Age of Exploration. By the 1500s, Europeans were travelling by sea to almost every part of the globe. Missionaries followed the European conquerors, traders, and colonists. After some time of studies and application to obtain the necessary permission, seven religious men (Augustinians) were appointed to initiate this new endeavour. They were “all men of great intelligence and talent and almost all of recognized holiness.”3 They embarked at Seville on March 3, 1533 and arrived in Mexico on June 7 of the same year where they were welcomed as guests by the Dominicans for more than a month until they had their own house. Preceded by the Franciscans and the Dominicans in mission, the Augustinians were not well treated by some in the beginning, and although defended by the first archbishop of Mexico and the Viceroy, they had to extend their efforts to regions not occupied by their Spanish co-laborers. Adding to their work of Christianizing, the missionaries committed themselves to an intense humanitarian and socio – cultural program from the beginning. Mexico served as a base of operations for missionaries in this century, and what have been mentioned about evangelizing, humanitarian and cultural work in Mexico also applies to the Augustinian missions in Latin America and the Philippines. They all arrived to the island of Cebu on April 27, 1565. 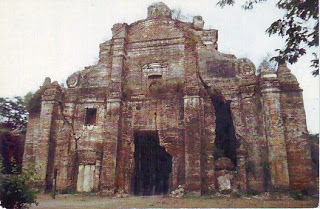 On May 5, they began the construction of the first foundation which the missionaries dedicated to the Child Jesus, in honor of the statue of our Saviour which Pigaffeta, the historian of Magellan’s expedition, had given to the ruler of Cebu and his wife in 1521, and which the Augustinians found upon their arrival. As to date, the Augustinians have been in the Philippines for 470 years. Jürgen Moltmann once said: “Historical awareness differentiates between the present past and the past present, and puts us in the position to discover the future in the past, to pick up past possibilities again to link them with the present future.”7 fr. ericson borre, osa. 1 Rano, Balbino, The Order of St. Augustine, 1975, 94. 2 Gutierrez, David, History of the Order of St. Augustine. Vol. II, (Pennsylvania: Augustinian Historical Institute, 1979), 207. 3 Kavanagh, Denis, The Augustinian Order, (Pennsylvania: Villanova Press, 1965), 59. 4 It was not until twenty years later that the Augustinians established themselves in the Philippines. Rano, p. 96. 6 The goal was not the archipelago named after Philip II, but rather China which the missionaries of Mexico were gazing in 1543. 7 Moltmann, Jürgen, Paradigm Change in History, (New York: Crossroad Publishing Co., 1991), 321. Note: This article was published the in the “In Deum” of the San Agustin Center of Studies, the seminary’s official journal magazine. Thanks Fr. Borrz for this informative and interesting facts of our history–missionary, culturally and ecclesiastically. I am interested to get some information on Fray Vicente Rivas. He is mentioned in the book as ….Fr. Vicente Rivas was a native of St. Vincent, in the province of La Coruna, where he was born 1779, and made his profession at School Valisolitano the 1798. In Visayas, he managed the people of Panay (1808), Jaro (1809), Camando (presently known as Leon) (1811) and Tigbauan (1816), and was in the province charges Vocal Prior (1833), Definer (1837) and Vicar Provincial of the Panay Island several years and died in Tigbauan the year 1838. I wonder if you can contact me in my email address Philcon.nt@gmail.com My name is Januario John R. Rivas who descended from Ciriaco Rivas of Tigbauan, Iloilo. I have a blood connection with Fray Vicente Rivas. Please help me get information about him. 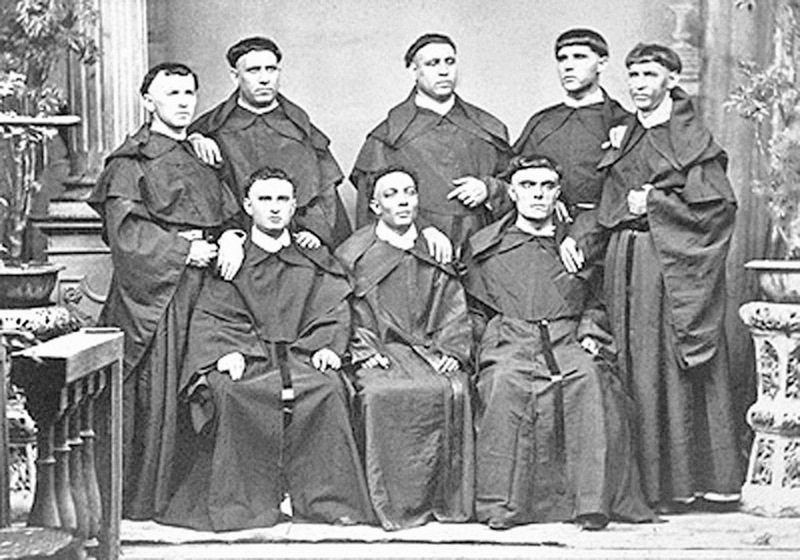 The photo of the 8 Augustinian Priest in your article, is he one of those 8 in the photo. If so, which one? I am making a documentation of Fray Vicente Rivas and would appreciate if you can give me information from the Augustinian archives in the Philippines. Unfortunately, I think Fray Rivas is not in the picture. It’s a different picture. This website is also maintained by an Augustinian friar. I am the same person who replied to your query in our facebook page. May I know at least the sources of your information about him. We may have either the same or different source. Fray Vicente Zernados Rivas was the Provincial Vicar of Panay and with his designation, He held the position as Parish Priest of St. John Sahagun church of Tibauan, Iloilo. He died in 1938. I am sure there are recorded information about him. I am keen to get into those articles or records about his work in Panay. Please lead me to the sources of information about him. Thank you. Here is a segment from the book in the archives of San Agustine, Intramuros Manila on Fray Vicente Rivas. The English translation came for the original Spanish note from Catalogo Bio-Bibliografico delos Religiosos Agustinos dela Provencia del Santisimo Nombre de Jesus de las Islas Filipinas por el R.P. Fr. Elvino B. Perez 1901, pages 51-52, “Rivas (Fr. Vicente) Fue natural de S. Vicente, de la provincia de la Coruna, donde nacio el 1779, e hizo su profesion en el colegio valisolitano el 1798. En Bisayas administro los pueblos de Panay (1808), Jaro (1809), Camando (1811) y Tigbauan (1816), y tuvo en la Provincia los cargos de Prior Vocal (1833), Definidor (1837) y Vicaro Provincial de la Isla de Panay varios anos, falleciendo en Tigbauan el ano 1838”. : (As researched by Fred and Rebecca Antonio from the San Agustin Church Archives, Intramuros, Manila). Based on the Profession Vow of Fr. Vicente Rivas on 5 Nov. 1798. He was a legitimate son of Martin Rivas and Maria Zernados from San Vicente. They were neighbors of the Bishop of Tui in San Vicente Felligresia of San Lorenzo de los Montes. He completed his provisionary training as an Augustinian priest at Royal Seminary College of Valladolid. The training of priests for the mission of the Philippines was part of the evangelization of the Philippines. Fr. Vicente Rivas was one of the Augustinian priests who was destine for the mission at the Province of the Most Holy Name of Jesus in Cebu, Philippines. From there, he was assigned to Panay and took the many duties and responsibilities including taking the role as Parish Priest of Tigbaun, Iloilo, Panay, Philippines.